Revolutionary technology is the name of the game. It combines powerful performance, the largest horsepower available to 4-stroke engines in the country with cleaner, reliable and better power generation. While the constant velocity carburetor, previously found only in large capacity bikes, ensures optimum fuel combustion and increased engine performance, there's no fear of overheating thanks to the liquid-cooled system and thermostat-controlled cooling fan. Its automatic cooling sensor control makes it a first among sports models. The 4-level adjustable mono-shock suspension provides dynamic, responsive handling even in the most challenging road conditions. Its highly-durable silent chain promises to save you a bundle on maintenance and fuel. 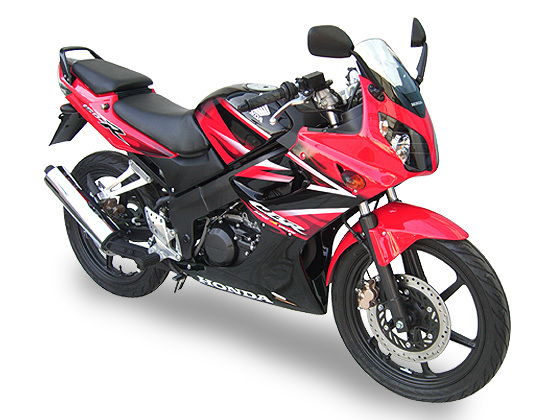 CBR150R utilizes new 4-stroke engine technology with Double Overhead Camshaft (DOHC), 4 valves, 6 gears and manual clutch, which delivers perfect combustion, 10,500 revolution per minute (rpm), excellent performance and maximum horsepower among the 4-stroke models in Malaysia. A first in sport model, the liquid cooled system of CBR150R is controlled by an automatic censor. Circulating coolant and a thermostat-controlled fan provide efficient cooling effect to prevent engine from overheating especially during heavy traffic and maintain the right engine temperature for optimum engine performance. CBR150R features an advanced Constant Velocity Carburetor, previously found only in big capacity bikes, to ensure perfect combustion and further boost engine performance. Deliver quieter performance with 2-3 times higher durability compared to conventional silent chain. It also saves on maintenance fee in the long run. Honda's leading 4-stroke technology provides cleaner, more reliable and greater power delivery over a broad range of engine speed. It is also highly fuel efficient and more durable. Complies with strict EURO II level 4 emission standard. Channels filtered air into exhaust gases in the exhaust pipe for cleaner emission. Changes exhaust gas through catalyzing conversion by utilizing two pieces of Metal Catalytic Converter and Catalyzer in the heat tube, same as found in automobiles. Redirect emission gas to flow back to filter and into engine room for perfect combustion without emitting gas to the environment. Unique diamond eye design combining four high performance lights raises safety level when riding at night. Side mirror handles are adhered to the windshield as big bikes do. Round built-in tail lights with separated signal lights further enhance the sporty look. Brightly illuminated metering cluster with clear display of speed, rpm, fuel, lights and engine temperature at one glance. 4-level adjustable monoshock suspension offers more dynamic and responsive road handling even in challenging road conditions. Anti-theft design greatly enhances bike security for total peace of mind. Designed with detailed emphasis on precise reinforcement for stability and reduced riding stress to offer better ride comfort. Front disc brake utilizes a rigid dual piston caliper with 276mm wide front disc, while rear disc brake features a single piston caliper and 220mm wide disc, to ensure powerful controlled braking.